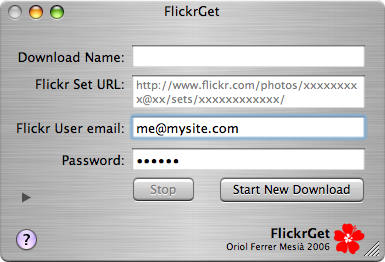 FlickrGet is a small application built to make the process of getting images from a user's Flickr Set easy. Then copy this URL and paste it into FlickrGet; choose a name for your download and type in your Flickr login and password (Only non-yahoo logins work for now). You can then start the download, and all the pictures from the set will be downloaded to a folder besides the FlickrGet application. The login and password information are optional, but some Sets are set to private so they can only be seen/downloaded if the user allows guests to see them. The photo Sets will be downloaded at the maximum available resolution, but flickr only allows this if you are logged in (and that will only happen if you put in your login and password). Yahoo flickr logins don't work. This app is no longer useful, as flicker migrated all their users to Yahoo.